Asked to name her favorite book, sixteen-year-old Carley Wells answers, “never met one I liked.” Her parents are horrified and decide to commission a book to be written just for her. They will be the Medicis of Long Island and buy their daughter The Love of Reading. At first, Carley’s sole interest in the project is to distract Hunter, the young bibliophile she adores. But as Hunter’s behavior becomes increasingly erratic, Carley begins to understand the importance of stories-and how they are powerful enough to destroy a person. Or save her. 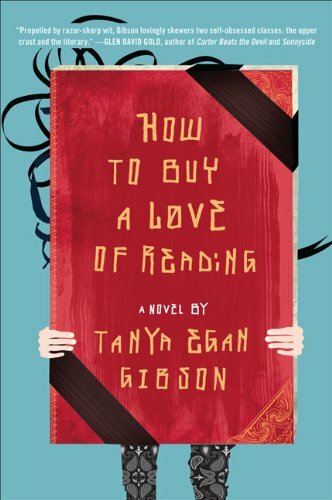 Tanya Egan Gibson’s debut novel is an irresistible work of metafiction that dazzlingly embeds a book within the book, and boasts an unforgettably fresh narrator whose journey towards embracing literature will make you fall in love with reading all over again. Tanya Egan Gibson lives in Marin County, California. How to Buy a Love of Reading is her first novel. At the beginning of the novel, we are shown a handout Carley filled out for her English teacher (p. 16). Later, we’re also shown a “Manifesto” she writes for Bree (p. 121). How did these documents color your initial impressions of her? Did your interpretation or understanding of her responses change once you read the entire book? Early in the novel, Carley “never knows the right thing to say” and claims not to understand situations until long after they have passed. How does she grow in this respect during the course of the novel? At which moments do we witness her seizing the moment instead of looking back over her shoulder at it? Every section of this book begins by giving you an invitation to a party. Why might the author have included these invitations? According to Bree’s e-mail to Carley (p. 139), what is “meta-fiction? Is How To Buy a Love of Reading a meta-novel? What is How to Buy a Love of Reading’s attitude about the notion of “meta”? Does it, in the end, undermine meta-fiction or validate it? For a book that is supposed to be about the love of books, this novel pays a considerable amount of attention to fictional television shows, including The Arion Annals, Bouncy House, The Frog Princess, and Caveman Land. How do aspects of these shows resonate with the action in How To Buy a Love of Reading? What does Glory of The Arion Annals, have in common with Carley and/or Bree? What might Gibson be implying about storytelling? Why do you think Carley finds herself using Bree’s “devices” (pages 186-193) when she finds Hunter passed out in his room? How do they help her cope? Why does she ultimately reject them after having “tried them on” this way? How do How To Buy a Love of Reading and the novel Bree writes for Carley, Dark Ages, echo and/or undercut each other? Are Jules and Buck merely doubles for Carley and Hunter, or is there something different going on within their narrative? References to The Great Gatsby appear throughout the book. What is How To Buy a Love of Reading’s attitude towards that classic? During a criticism of Bree’s work on Dark Ages, Carley asks, “Aren’t people the point of stories?” When Bree corrects her by saying, “Characters,” Carley responds, “Same difference” (pp. 288-289). What does Carley mean by this? Bree calls backstory “lazy” (p. 234). Carley’s English teacher says it’s “messy, clotty stuff.” So why does How to Buy a Love of Reading include so many sections of it? And why does Carley think it is important? Why might the novel be organized into parts named for literary terms—Setting, Plot, Devices, Backstory, Theme, Time and Tense, and Point of View? In what ways might this novel be teaching the reader, throughout the narrative, how to read it? Carley’s English teacher and his literary terminology lessons are characterized as ridiculous. Why would the author do this?